If you are looking for information on the All About Kids Learning Center franchise business opportunity, All About Kids Learning Center franchises or All About Kids Learning Center franchising, then you have come to the right place. All About Kids is committed to partnering with parents in the best interest of each and every child. Our number one goal is to provide each child with the tools that they will need to advance in education and to be prepared for the ever changing world around them. Our desire is to offer families a state of the art facility and a caring and well educated staff that will work with them to build a solid foundation for our children. As a learning center, we challenge children with individual and teacher facilitated activities throughout the day. All About Kids is a franchise that allows individuals to fulfill their dreams of owning their own business while playing an integral part in social, emotional, cognitive and physical development of children. To develop All About Kids, along with franchise partners, into the leader in the child care industry. We offer Franchisees a proven system for success. We will only sell franchises to people who have the same passion for child development as we do. We feel this is the most important aspect of succeeding as an All About Kids franchisee. 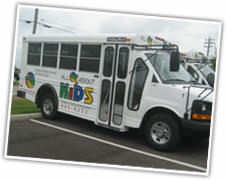 All About Kids has become the regional leader in green building construction and operations in the childcare industry. Our standard building is designed with energy efficient systems and environmentally sensitive materials. Operations and maintenance protocol are guided by green principles of healthy indoor air, proper building maintenance, and water and energy efficiency. All About Kids knows that green facilities result in happier, healthier and more productive children and staff. Our Green Imitative is one aspect that sets us apart from other centers. 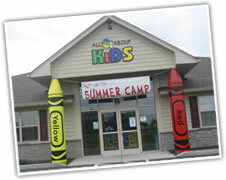 All About Kids offers a hands-on, turn key approach to setting up a successful Child Care Center. Together we'll walk through: financing; site selection & building design; staffing & accounting systems; licensing; training and operations. We are with you EVERY step of the way. Presently offering franchises in Ohio, Kentucky and Indiana.